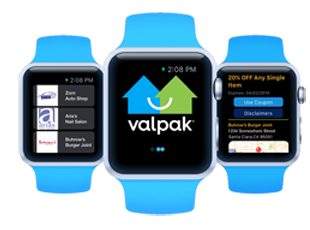 (ST. PETERSBURG, FL – April 22, 2015) — Leading the way in technology, Valpak® announces its new coupon app will be available for download for the Apple Watch™, making it one of the first coupon companies to offer savings for the new device, and making it easier than ever for consumers to get savings right in their neighborhoods. “We’ve always been right there for consumers, finding the great offers on shops and services in their neighborhoods. Now we make getting those savings easier than ever,” said Michael Vivio, president of Valpak Direct Marketing Systems, Inc., and Cox Target Media, Inc. Known for its local coupons in North America, Valpak has also become a leader in mobile couponing recently focusing heavily in the mobile space. Valpak has shown an ongoing commitment to consumers with its mobile app presence in the top mobile operating systems and integration into mobile wallets, including Passbook®, Samsung® and Google®. “Valpak is there at the launch of the Apple Watch launch, just as we were with the Passbook wallet launch,” said Vivio. That means the Valpak app is compatible with Passbook, so coupons can be stored there ahead of time on the phone and will pop up on the watch screen to let consumers know there are savings available nearby on their favorite shops and services. With the convenience of the new Apple Watch, consumers can now find savings just a tap away on their wrist and have access to coupons for stores and services within a 25 mile radius. 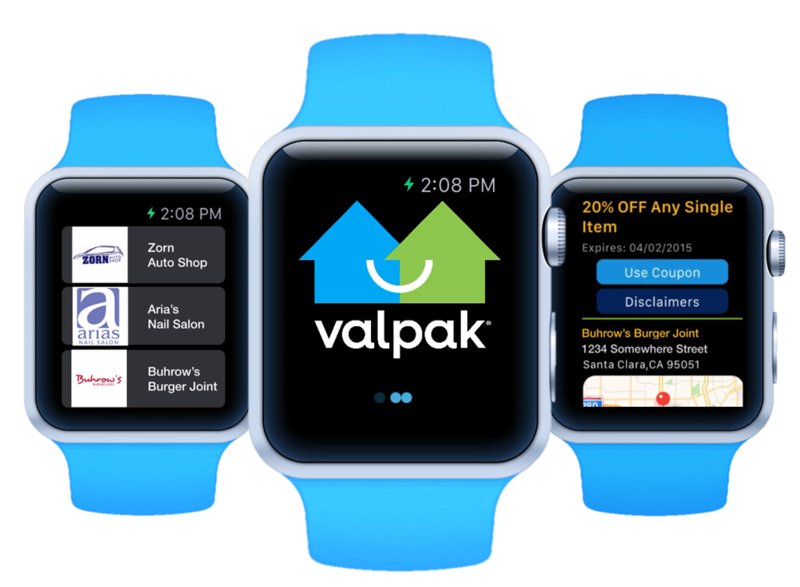 No matter where they are, consumers can download the Valpak coupon app for Apple Watch and get savings when they need them. All the Valpak offers that are on the Valpak smart phone apps, as well as Valpak.com, will also be available on the watch app. The app is especially helpful to find savings on the go for restaurants, services such as health and beauty, as well as automotive offers such as car washes, oil changes and tires. To use the app, consumers need to download the app on their iPhone®. They then tap on the Valpak icon. They can scroll to see services, restaurants and more, choose the offer with a quick tap and even get directions. A unique coupon code will be displayed on the screen, which they can show to the store clerk to redeem. “Valpak is committed to focusing on first-to-market applications and products,” said Vivio. “As wearable technology becomes more widely adopted by consumers, we’ll then begin to build out other products as well,” he said. Valpak® is at the heart of communities across North America, helping people save, businesses grow and neighborhoods thrive through a network of local franchises in the U.S. and Canada. Valpak marketing consultants live and work in your neighborhood. We know what your customers want (we are them!) and can help you take the guesswork out of advertising with real-world marketing solutions that drive measurable results. From the mailbox to online to mobile devices, Valpak continues to find innovative ways to connect businesses with consumers. Monthly, close to 40 million homes receive The Blue Envelope® of savings and traffic on valpak.com and our syndication partner sites exceeds 110 million. Backed by the muscle of Cox Target Media, Inc., your local Valpak office has the means and know-how to custom build a marketing campaign that meets your needs and budget. Let us introduce you to the neighborhood. Call Valpak at 1-800-676-6878.